Saturday Speculation: New Dow Component. A Hint or an Error? Today I was looking through some fact sheets on the Dow website and I believe either an error has been made or Dow Jones accidentally leaked the next Dow component. Now to analyze both the Dow 10 (published March 31, 2009) and Dow 5 (published April 30, 2009). Dow 10 as stated on their website: "To represent the 10 stocks in the Dow Jones Industrial Average with the highest dividend yield." Dow 5 as stated on their website: "The Dow 5 measures the five lowest-priced stocks in The Dow 10, which represents the 10 stocks in the Dow Jones Industrial Average with the highest dividend yield." If the Dow 5 is selected companies from the Dow 10, and the Dow 10 are the select companies from the Dow Jones Industrial Average (see first image below of all 30 Dow components and close price as of May 29, 2009. 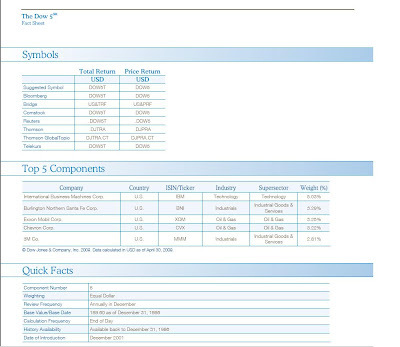 Taken from CNN Money), something isn't quite right here on the Dow 5 fact sheet, Burlington Northern (BNI) is listed as the second of the 5 components (see second picture below. Taken from Dow Jones fact sheet). (click images to enlarge). Now with the bankruptcy of General Motors GM) likely to come Monday, the Dow will need to reshuffle the index. Could this be a mistake which is leaking the next Dow component, or just an error which means nothing? If anyone can explain this, then please do, perhaps I am missing something. I understand that Burlington Northern is part of the Dow Jones Transportation index, but not the DJIA. In conclusion, I assume it would be good news for BNI if they were added to the DJIA (good news for any company added to the DJIA for that matter), as recently posted in an article that measures the performance over 3 and 6 months of newly added components to the Dow. As recently posted on my blog, I believe Sirius is due for a slight rally. I was lucky enough to pick up some Sirius Thursday for 30 cents a share, and write covered calls for the December $1 strike for 10 cents a share Friday. This brings my cost down to 20 cents a share. In my opinion, the major reason Sirius has sold off recently is not due to the last earnings report, but because of all of the negative news lately about the auto industry, particularly General Motors (GM) and the likelihood of a bankruptcy June 1. We can look at their charts since May 1 (day Chrysler filed chapter 11), and we can see that SIRI may be a bit oversold on the news. As of Friday May 29, GM was down 60.93% and Sirius was down 10.25%. However as of Close Thursday May 28, GM was down 41.67% and SIRI was down 17.82%. We can see that on May 21 Sirius seemed to be much oversold compared to GM, on the GM news; it was actually down more than GM. This chart looks as if SIRI buyers have stepped in and are supporting the stock near 30 cents, even as GM is selling off. I take this as a good sign for SIRI, and this is one of my major reasons for stepping in and getting long SIRI here. Let's face it, when GM files chapter 11 it's not the end of the world for SIRI as Ford (F), Toyota (TM), GM (during restructuring), as well as the other auto companies will still be putting the satellite radios in their vehicles. Not to mention if the "prepackaged" bankruptcy goes better than expected, we may even see SIRI rally. I believe once the bankruptcy is over and done with, SIRI will return to normal trading (more or less tracking the regular indices). The intraday chart from Google (GOOG) on Friday May 29 shows and inverse relationship between SIRI/F and GM. As GM’s loss accelerated throughout the day, both Sirius and Ford’s gains also accelerated (with the overall market). Below is a Buy/Write option strategy for SIRI (for more information about these strategies check out my blog) that will reduce risk by as much as 33%. Buy SIRI at or below 30 cents a share, and sell the December $1 call option for a premium of 10 cents a share (the current bid is a nickel but some contracts have been getting filled for a dime a share every day, you may have to be patient or may choose to take the nickel). This would lower your risk by 30%+ on your SIRI shares, and have a chance of making a 400% return if you get called away. You also have the chance of keeping the shares if SIRI does not get to $1+ by December, and as long as SIRI is above 20 cents a share at expiration (when contracts expire) you will have a net gain. The options market is one of many ways to get an idea of where an individual security may be at a set point in time. The way you can find this probability is the calculated Delta value. For more on stock options and options pricing click here. With Chrysler filing bankruptcy May 1, and General Motors' (GM) deadline approaching on June 1, I thought it would be interesting to see what the options market is factoring in. I observed the probabilities for GM's stock price to close at or above $1.00 and $2.00 per share, for the following options expiration dates. As of Thursdays close GM's stock was valued at $1.12 a share. NOTE for January Leap Option Contracts the lowest Strike available is $2.50 therefore the next two probabilities will be for the $2.50 strike price. The current options market is factoring in a very high probability of bankruptcy in GM's future, as reasons may be obvious. Someone could open an option contract to own the rights on GM's stock at $2.50 a share until January 2011 for $17 per contract (17 cents a share premium). Perhaps my most interesting find is the probability that GM's stock will close at or above $2 a share for Junes 24.8%, which may seem very odd as GM would have to shoot up by nearly 79% from Thursday's close. The 30 day historical implied volatility is extremely high which explains this probability. Similarly for Ford (F) we can analyze the probabilities for the stock to close at or above the nearest current value ($5.56) and approximately double that. Derivative markets are useful to get an idea, but change day to day. No investment or trading strategies should be formed based on options probabilities. As of pre-market Friday May 29, 2009 these are the probabilities of these two auto dealers... Time will tell what the outcome of these companies and their share prices will be. Many have been wondering lately which company will take the place of GM in the Dow Jones Industrial Average, if they happen to file chapter 11. GM has been listed on the Dow since August 31, 1925 (second oldest only to General Electric (GE)). In my opinion, whether GM files chapter 11 or not, getting delisted from the Dow seems inevitable. There are so many other strong American companies that deserve to be in the Dow Jones in place of GM. A short while back I started a contest on my blog to see who could guess the next component of the Dow being delisted. Currently almost 75% of the votes are for GM and the rest for either Bank of America (BAC) or Citigroup (C). I have been doing some research and I have found that once a company is added to the Dow (last 5 additions) the price of the stock rises on averages 5.16% in the first three months, and 6.58% in the first 6 months of being added to the index. Below are some of the most recently added stocks, the date, (all stocks added the last 5 times the index has changed), and their performance over 3 months and 6 months respectively. In my opinion I think Google should and will replace General Motors on the Dow. The majority of the guesses on my blog for the component to be added were for the following (in order from most guesses to least): Apple (AAPL), Research in Motion (RIMM), Google (GOOG), Goldman Sachs (GS), and Visa (V). Although Visa is a great company, I do not think they have a very good chance, as they are not even listed in the S&P 500 yet (soon they will be as their market cap is bigger than both MA and AXP combined). Whether or not these averages mean anything (stocks being added during bull and bear markets will make a big difference), in my opinion it is a good sign for a company to be added to the index. Time will soon tell how the Dow will be reshuffled. Please feel free to share your thoughts on which companies are good candidates for the Dow. If you are slightly bullish or think the market will move sideways in the months to come, you may find it useful to use the buy/write strategy. I have been using this with various stocks over the past month, and write them out for the nearest expiration or next expiration. To learn more about buy/write option strategies check out my BLOG. In this article I will be giving you some of the best rated buy/write option strategies as well as some I have used in the previous 6 months. Although I do not like holding onto leveraged ETF’s too long, I find them good for these strategies as they offer very large premiums (because they are so volatile). All options pricing, probabilities, and stock discount % is based as of pre-market Thursday May 28, 2009. Option Buy/Write Strategy 1: Buy Apple (AAPL), sell covered call for June 130 strike. This would give you over a 5% discount on Apple shares. The options market is factoring in a 61.7% chance you’ll get called out on these shares. Option Buy/Write Strategy 2: Buy ConocoPhillips (COP), sell covered call for July 45 strike. This would give you over a 4.8% discount on Conoco shares. The options market is factoring in a 47.9% chance you’ll get called out on these shares. Option Buy/Write Strategy 3: Buy DeVry (DV), sell covered call for July 45 strike. This would give you over a 5.5% discount on DeVry shares. The options market is factoring in a 46.6% chance you’ll get called out on these shares. Option Buy/Write Strategy 4: Buy Devon Energy (DVN), sell covered call for July 60 strike. This would give you over a 6.9% discount on DVN shares. The options market is factoring in a 54.5% chance you’ll get called out on these shares. Option Buy/Write Strategy 5: Buy Ultra Petroleum (UPL), sell covered call for July 45 strike. This would give you over a 5.9% discount on UPL shares. The options market is factoring in a 49% chance you’ll get called out on these shares. Option Buy/Write Strategy 6: Buy FedEx (FDX), sell covered call for July 55 strike. This would give you over a 5.6% discount on Fedex shares. The options market is factoring in a 46.9% chance you’ll get called out on these shares. Option Buy/Write Strategy 7: Buy Caterpillar (CAT), sell covered call for July 36 strike. This would give you over a 5.9% discount on CAT shares. The options market is factoring in a 46.7% chance you’ll get called out on these shares. Option Buy/Write Strategy 8: Buy Nike (NKE), sell covered call for July 55 strike. This would give you over a 5.2% discount on Nike shares. The options market is factoring in a 49.9% chance you’ll get called out on these shares. Option Buy/Write Strategy 9: Buy Celgene (CELG), sell covered call for July 40 strike. This would give you over a 7.3% discount on Celgene shares. The options market is factoring in a 59.7% chance you’ll get called out on these shares. Option Buy/Write Strategy 10: Buy GameStop (GME), sell covered call for July 22.50 strike. This would give you over a 6.5% discount on GME shares. The options market is factoring in a 49.9% chance you’ll get called out on these shares. can’t be for everyone, so you may want to try an option spread. Check out my blog for more on option spreads here. Option Buy/Write Strategy 12: Buy Goldman Sachs (GS), sell covered call for July 140 strike. This would give you over a 7.2% discount on GS shares. The options market is factoring in a 53.1% chance you’ll get called out on these shares. Option Buy/Write Strategy 13: Buy McDonalds (MCD), sell covered call for July 57.50 strike. This would give you over a 3.2% discount on MCD shares. The options market is factoring in a 52.4% chance you’ll get called out on these shares. Option Buy/Write Strategy 14: Buy Transocean (RIG), sell covered call for July 75 strike. This would give you over a 5.9% discount on RIG shares. The options market is factoring in a 51.4% chance you’ll get called out on these shares. Option Buy/Write Strategy 15: Buy Walmart (WMT), sell covered call for July 50 strike. This would give you over a 3% discount on WMT shares. The options market is factoring in a 45.4% chance you’ll get called out on these shares. Option Buy/Write Strategy 16: Buy Intel (INTC), sell covered call for July 15 strike. This would give you over a 7.4% discount on INTC shares. The options market is factoring in a 59.6% chance you’ll get called out on these shares. Option Buy/Write Strategy 17: Buy 3M (MMM), sell covered call for July 55 strike. This would give you over a 6% discount on 3M shares. The options market is factoring in a 56.8% chance you’ll get called out on these shares. Option Buy/Write Strategy 18: Buy Palm (PALM), sell covered call for June 11 strike. This would give you over a 11.4% discount on Palm shares. The options market is factoring in a 51.6% chance you’ll get called out on these shares. Option Buy/Write Strategy 19: Buy SPDR S&P (SPY), sell covered call for July 91 strike. This would give you over a 3.2% discount on the SPY. The options market is factoring in a 45.3% chance you’ll get called out on these shares. Option Buy/Write Strategy 20: Buy SPDR Gold (GLD), sell covered call for July 95 strike. This would give you over a 3.1% discount on GLD shares. The options market is factoring in a 45.7% chance you’ll get called out on these shares. With these strategies some may be written in the money and some may be written out of the money. The more volatile the underlying stock the more the premium will be. Some of the strategies with a lower discount may be because they are trading below the indicated strike; this means if you get called out you’ll receive additional profit from a gain in the sale of the underlying stock. Similarly this can be said for any of these stocks with a greater discount to the stock, this is because if you get called out you may take a small loss on the sale of stock (all strategies sure to net a profit if called out). You will most likely have to adjust strike prices and expiration dates according to your opinion. I have been using this strategy for various stocks such as RIMM, TNA, FAS, UYG, BAC, and POT month after month buying the stock and writing it out immediately. I aim for a 5%-6% gain monthly (60%-72% annually). If I do not get called out I simply wait for the stock to gain a little strength and write it out again for the next expiration. If you are a bit more bearish this strategy may also be for you, you will just need to adjust strike prices and write the stock out deeper in the money. I have found that writing stocks out to the nearest expiration has returned the greatest profit. In this post I will talk about some option plays I have been / will be using to capture a potential large upside with a limited downside. I’ve been very bullish on commodities lately which will explain some of the equities I've used early in this article. In this post I'll be talking about Bull Call Option Spreads, to understand this you must be familiar with stock options. To learn more about stock options check out my option E-Book. All of the strategies used in this article are currently priced with the higher end of the option spread having a greater than or equal to 40% chance of expiring in the money, and having the potential of returning at least double your initial investment if they hit and close above the higher strike price of the spread (according to options pricing as of pre-market Wednesday May 27). Spread Strategy # 1: Buy the SPDR GOLD Trust (GLD) July $94 Call and sell the July $96 Call. The $96 call option is factoring in a 42.9% chance it will expire at or above it at July expiration. If it happens to expire at or above $96 return would be 150%. Similar strategies can be used for GOLD, UGL, GG, GSG, and other gold and mining equities. Spread Strategy # 2: Buy the United States Oil Fund (USO) June $34 Call and sell the June $35 Call. The $35 call option is factoring in a 41.4% chance it will expire at or above it at June expiration and would return 122% if it did. Similar strategies can be used for UCO, XLE, UNG, DIG, XOM, and other oil and gas equities. Spread Strategy # 3: Buy Apple (AAPL) July $130 Call and sell the July $135 Call. The $135 call option is factoring in a 44.9% chance it will expire at or above it at July expiration. If it happens to expire at or above $135 return would be 108%. Similar strategies can be used within the tech sector on stocks such as RIMM, PALM, AMZN, EBAY, GOOG, YHOO, MSFT, and many more. Spread Strategy # 4: Buy SPDR S&P Depository Receipt (SPY) July $92 Call and sell the July $93 Call. The $93 call option is factoring in a 43.4% chance it will expire at or above it at July expiration, and would return 108% if it did. Similar strategies can be used for the DIA and the QQQQ. If you want to take on more risk with a greater potential reward you could also use a similar strategy with the leveraged ETFs such as SSO, BGU and many more. Spread Strategy # 5: Buy the Financial Select Sector SPDR Fund (XLF) September $12 Call and sell the September $13 Call. The $13 call option is factoring in a 43.8% chance it will expire at or above it at July expiration. If it happens to expire at or above $13 return would be 122%. Similar strategies can be used for other sector ETFs such as XLP, XLU, XLY, XLV, and XLK, as well as individual financials such as AXP, BAC, BK, C, GS, JPM, and many more. If you want to take on more risk with a greater potential reward you could also use a similar strategy with the sector leveraged ETFs such as UYG, FAS, UYM, and many more. All option spreads must close at or above higher end of the spread at expiration to receive the maximum profit from the strategy. It is possible to lose 100% of your investment if the underlying equity closes below the lower end of the spread. These spreads can be traded which I find works well in this volatile market. With many stocks it is possible to find a strategy that offers a 40% chance of expiring at or above that returns 100% profits. The odds are still not in your favor, but it is a way to capture a large upside with minimal downside. By choosing different strike prices and expiration dates you can adjust the chances of expiring in the money, and the profitability from the spread. I use the 40% 100% rule as I never have to go out too much further than 3 months- keep in mind a lot can change with options pricing overnight. I have been debating whether or not to blog about this high risk high reward strategy, but tonight I've decided to share it. I would like to open a position on Sirius satellite radio and sell the rights to the shares for the December $1 strike for a dime a share. I have a limit in to buy the stock for 30 cents a share, and if I happen to get it I will put a limit order in to sell the rights for a dime a share for the December $1. In the meantime I will put a stop loss at 28 cents a share. If I can complete this buy/write I will be in SIRI for a discount of 33% a share, and have the chance of a 350% return on my investment (aka gamble). I feel that with all the negative news lately about the auto industry, particularly GM, SIRI has been unjustly beaten. A chart below shows that SIRI has been beaten almost half as bad as GM, when SIRI has been rescued and GM is on the verge of bankruptcy. I just feel that SIRI is oversold here. I will keep you posted whether or not I am able to get into this strategy, but my assumption is there will be significant selling pressure on SIRI within the next few days as GM's deadline approaches. I do not think I'll be able to sell the rights to my SIRI for a dime for a while, I do believe that after GM is over and done with their bankruptcy filing, buyers will return to SIRI stock. With the Outlook on UK's credit getting reduced Thursday, it gave serious speculation that a US credit downgrade could soon follow. The reason for this speculation is because the US and UK have spent way too much money! If the U.S. credit gets downgraded I imagine the dollar will become much weaker. I believe it will sink lower than the lows set in summer of 2008. Some ways to take advantage of a weak dollar are outlined below. I have been implementing various option strategies to take advantage of some of the moves I expect [if the US credit gets downgraded]. To see a list of option strategies I have been using check out my blog. This is the most straightforward thing to do if you expect a weak dollar; you just need to know when to cover. The Good: If the credit gets downgraded the dollar should sink, and you should be able to make a profit off this play. The Bad: If the credit doesn't get downgraded- I imagine the dollar will move sideways if not get a bit stronger causing a loss in this play. Some ways to short the dollar without getting into FOREX is playing the PowerShares bearish USD ETF (UDN). I have been buying near the money option call spreads on the UDN as my hedge against a credit downgrade. Gold trades in US dollars, therefore a weak US dollar causes gold to rise. The Good: If the dollar gets weak, we could see gold hit record levels in the months to come. If you're long gold as it is hitting new highs, then you should be able to pull a profit by riding gold up. The Bad: Similar to the dollar, if the US credit does not get downgraded in the months to come, it could cause gold to move sideways or perhaps depreciate in the near term. (Near term because I expect gold to rise significantly, as I expect inflation to be very high within the next 18 months). Just like gold, crude too is traded in US dollars, and a depreciation of the dollar could cause crude to heat up. Looking at a chart we can see that crude oil peaked while the dollar was the weakest (in terms of the Euro) within 1 month of each other. The Good: If the dollar gets weak, I believe we could see oil get back to the $70-$80 per barrel range fairly easy, if you're long black gold as it is shooting up, you should be able to take some profits along the way. The Bad: A downgrade on the US credit could signal a rougher road ahead, causing oil to collapse (demand side). Some ways to play crude oil as well as other commodities include ETF's such as USO, UCO (double leveraged), GSG, as well as some oil service names that may benefit from the price crude increasing. This may be the silver lining of the bunch. If the dollar gets crushed on a credit downgrade, we know from basic economics exports are sure to rise. The Good: If the dollar gets weaker, it is sure to cause an increased demand for American made goods, causing a company’s sales to increase (maintaining the same margins) and showing up on the bottom line. If you hold a long position in a company who is benefiting from a weak dollar, you should see a more valuable equity. The Bad: It could take months before a company shows any benefits from a weak dollar. If the overall market sells off on the news of a credit downgrade, the benefits received from increased exports and profitability may simply just offset the initial sell off. Look for companies who export high dollar merchandise. One company I am buying longer term out of the money bull call spreads on is Caterpillar (CAT). This is because Asia is still demanding heavy machinery and will demand more if it becomes cheaper to them. All of these cases are ways to profit from a weak dollar. Although it may seem like I am pulling for a US credit downgrade from this article, as I state "The good", I assure you I am not. 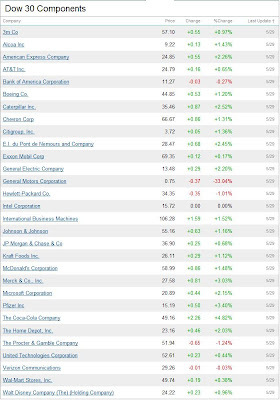 Here is a fresh list of stocks I will be keeping my eye on as of May 26, 2009. These are the current highest bull/bear rated stocks my screener has returned. To get a detailed definition of the bull/bear components check my Bull/Bear Ratio Defined Blog post by clicking here. I am pleased to announce my E-Book has been lowered by over 35% and is now just $4.99. Now offered with a full money back guarantee as well! What can you lose? If you don't lean the basics you get 100% of your money back! If you do understand after reading, I guarantee you will get your investment back by writing just your first covered call!